« How do I tune a process control loop? Will your process medium corrode an instrument connection and the pressure-sensing element? These chemical “attacks” can cause expensive instrument failures and unscheduled downtimes. Does your process medium have suspended solids? Or is it viscous enough to clog the instrument connection and the sensing element? 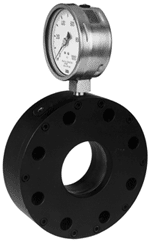 Blocked pressure ports prevent accurate measurements. Is your process prone to temperature changes, where the process medium could freeze or solidify in the instrument connection or sensing element? Solid media blocks pressure ports, prevents accurate measurement, and can distort the diaphragm of your measuring instrument. Does your process media change? And do you need to flush the system to prevent contamination? If there’s a possiblity that media can contaminate the instrument or sensor, a seal will be critical. Does your process require a sanitary connection? Most instruments don’t meet 3A sanitary standards because there are crevices in their design, or they can’t withstand the temperature requirements of steam cleaning. A 3A-approved diaphragm seal provides a sanitary connection, and allows easy cleaning between batches. Is your process in an area prone to high ambient temperatures, vibration, or harsh environments? Do you have problems with space and accessibility? A diaphragm seal ensures reliable and accurate pressure measurements because you can remote-mount the measuring instrument to avoid the troublesome conditions. Okay, so I need a chemical seal. Now what? The next step is picking the right seal. Here’s a basic list of what you need to know. Mounting Type: threaded, flange-attached, pancake mount between two flanges, weld-attached, and sanitary clamp-attached. Material Compatibility: Consider all chemicals the seal will be exposed to during service. Pick the seal material that will best stand up to corrosion, pitting, stress cracking, embrittlement, and hydrogen permeation. If you have an extremely caustic media, look at an all-Teflon insert, flange attached seal or a pancake-style ring seal. Attachment to Compatible Instruments: Every seal has a different volumetric displacement or sensitivity. If the displacement of the seal is less than that of the sensing instrument, they will not work. Seal displacement MUST be greater than that of the instrument. Process Working Pressures: This is important for extremely low or high pressures. Between 100 and 1000 PSI, almost any seal will do. Use elastomer seals for low pressure, so the diaphragm will flex enough to transmit the pressure to your instrument. For high pressures, a metal diaphragm is a better choice, because they’ll last longer in most applications. Process Temperatures: To transmit the process pressure through the seal to the sensing instrument, the sensor is filled with a fluid. 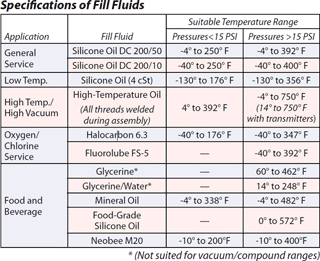 All fill fluids have different stable operating temperature ranges. If you exceed the fluids’ temperature limits, they can boil and destroy the seal, the instrument, or both. Each type of fill has a specific use and can dramatically change the cost to fill the instrument and seal. For 99 out of 100 users, chemical seals are NOT after-market add-ons. (You can’t just screw your gauge to a seal and expect it to work.) The equipment and skill necessary to vacuum evacuate, backfill, and seal an instrument with a chemical seal is not trivial. Though you may be technically capabhle of mating instruments with seals, I don’t recommend it. Lesman works with manufacturers and assemblers to deliver the combinations of gauges, switches, transmitters, and seals you need to fit your application. There is a downside to using chemical seals. They reflect temperature changes as well as pressure changes. A seal and an instrument assembly is a filled system that acts like a thermometer. As the fill fluid increases in temperature, the pressure it exerts increases (according to the laws of physics), even though the process is not exerting that component of the total pressure. The effect is always there, but is a bigger percentage (and more impact) in low pressure systems. For example, consider a filled system seal-sensor used for head pressure level measurement on an outdoor tank. The tank level remains absolutely constant, but the indicated level varies − higher level in daytime when it’s warmed by the sun, lower level at night when it’s cooler − even though the head pressure due to level is a constant. This entry was posted on January 17, 2012, 1:58 pm and is filed under Honeywell, Pressure, Pressure Gauges, Pressure Switches, pressure switches, Pressure Transmitters, pressure transmitters, Siemens, Switches, Transmitters, United Electric, WIKA. You can follow any responses to this entry through RSS 2.0. You can leave a response, or trackback from your own site.